Eye Dull Musings: Young Great Blue Heron? It's a foggy morning and this little guy is doing some fishing outside my window. I'm pretty sure it's a young great blue heron. It seemed a little big to be an immature egret. great picture for a foggy day!!!!!!!!!!!!!!!!!!!!!!!!!!!!!!!!!!!!!!!!!!!!!!!!!!!!!!!!!!!!!!!!!!!!!!!!!!!!!!!!!!!!!!!!!!!!!!!!!!!!!!!!!!!!!!!!!!!!!!!!!!!!!!!!!!!!!!!!!!!!!!!!!!!!!!!!!!!!!!!!!!!!!!!!!!!!!!!!!!!!!!!!!!!!!!!!!!!!!!!!!!!!!!!!!!!!!!!!!!!!!!!!!!!!!!!!!!!!!!!!!!!!!!!!!!!!!!!!!!!!!!!!!!!!!!!!!!!!!!!!!!!!!!!!!!!!!!!!!!!!!!!!!!!!!!!!!!!!!!!!!!!!!!!!!!!!!!!!!!!!!!!!!!!!!!!!! Hi Brian! How big was the bird? 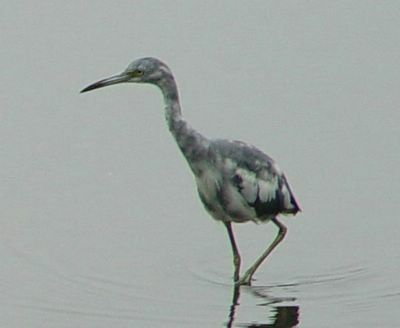 I think it's an immature little blue heron. They're 27" tall and are white when young and blue when adult. (blotchy blue-grey when transitioning) Also the two tone bill looks like a little blue rather than a great blue.... Great Picture! Thanks Linda! I hadn't heard of a little blue heron. It sounds like that was it. It was pretty small - about the size of a seagull.